Pacific Life Open - Box Seats Available! USTA Central Arizona has two Courtside Box tickets for the day sessions on Saturday & Sunday, March 22 & 23, 2008. This is the semi finals and finals of the tournament! As a fundraiser for the Junior programs for USTA Central Arizona you can buy two tickets on Saturday or Sunday for $800 or both days for $1,500. Head/Penn donated these tickets, so these are great box seats! 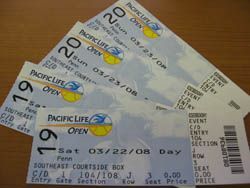 For information on the Pacific Life Open, go to www.PacificLifeOpen.com. For questions on the tickets or to purchase contact Larry@phoenixtennis.com or call Larry Funk at 480-951-4333.